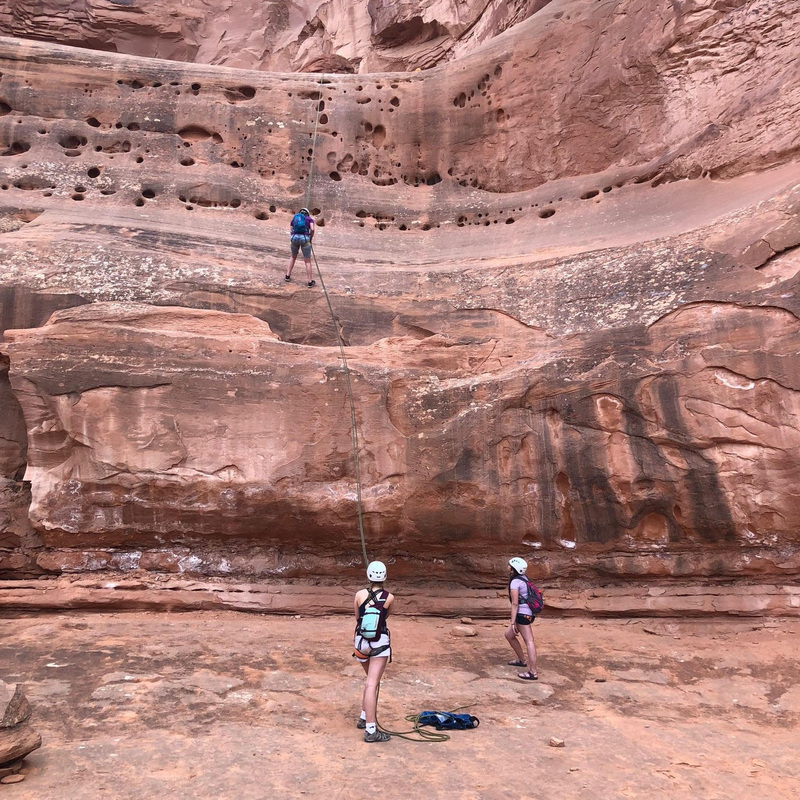 On an adventure-learning trip that began March 25, fifteen Mile High Academy students and three teachers drove seven hours to meet up with RMC assistant youth director Brent Learned in Moab, Utah. There, they enjoyed learning the arts of mountain climbing, mountain biking and trail maintenance. Adult chaperones provided an an engaging worship thought each morning, after which they breakfasted and set out for adventure. 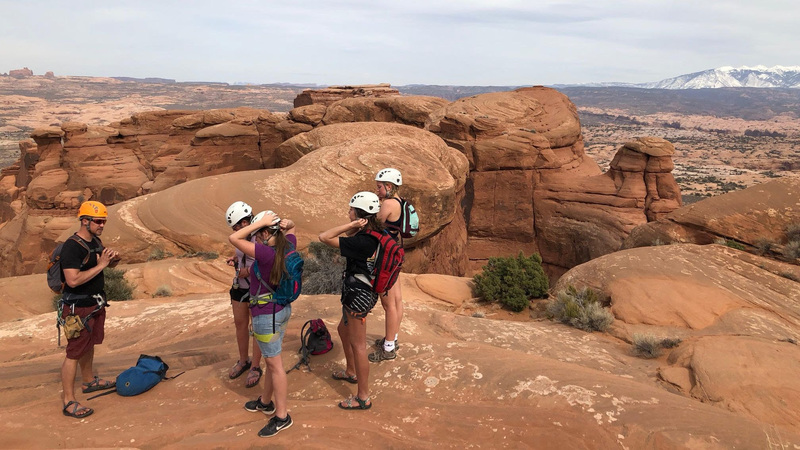 On Tuesday, students hiked to the iconic Delicate Arch and canyoneered (a mixture of rock climbing and hiking) through U-Turn canyon, the perfect canyon to explore for those new to the sport. It contains four repels ranging in height from 10 feet to more than 80 feet in length. Students learned how to use equipment correctly on the first two small repels before venturing on to the significantly longer final two repels. Emotions ranged from a moderate fear of heights by some to excitement and exhilaration by others as each student learned to trust their guides (RMC assistant youth director Brent Learned and MHA math teacher Brian Howard), trust each other as a canyoneering team, and trust the repelling equipment. One by one, they stepped over the cliff edge to begin their gentle decent toward the ground below. Wednesday started early with everyone working together to complete more than three miles of mountain bike trail maintenance in the Klondike Bluffs mountain bike trail system. This was accomplished under the direction of four trail building experts from a local non-profit organization fittingly called “Trail Mix.” Students learned how to sustainably build world class mountain bike trails for thousands of people to enjoy this summer and for years to come. After completing the assigned trail maintenance, the majority of the group mountain biked the trails that they had just repaired along with several additional trails located within the Klondike Bluffs area. After mountain biking, students hiked to a nearby site containing fossilized dinosaur tracks. Students examined the tracks and discussed the type, age, and size of the tracks present. Thursday was rock climbing day. Brent Learned and Brian Howard taught students to climb up a sixty-foot, near vertical rock face. They learned not only how to tie rock climbing knots and use the gear correctly, but they also learned rock climbing body moves and belaying techniques to safely and effectively climb to the top of each route. Each climber was cheered and encouraged up the wall by their friends. Whenever a climber reached a point where they thought they could climb no further, the students on the ground would cheer them on each step all the way to the top of the route.